March 18, 2015 – We rarely imagine that a water crisis could hit the homeland, but if you think that what happens overseas couldn’t happen here in America, you’d be very wrong. It only takes one disaster, natural or man made, to compromise our water supply. In fact last year, 400,000 people in Toledo, Ohio, were without safe drinking water for days due to toxic algae in the water supply. A chemical spill in Charleston, West Virginia, made water unsafe to drink for weeks. In the United States, we usually take clean drinking water for granted, but as thousands of people learned during Hurricane Sandy and Hurricane Katrina where many drinking water systems were impacted, Americans are just one disaster away from gaining a quick understanding of what 748 million people around the world experience every day – the challenge of getting access to clean water. In both U.S. disasters, World Vision responded and after Hurricane Katrina, it opened a 40,000-square-foot distribution center in Mississippi where $8.2 million in goods were distributed to more than 318,000 survivors. World Water Day is March 22nd and Dr. Greg Allgood, World Vision’s Vice President of Water, is on a mission to let the world know about the opportunity to solve the global water crisis. Question: How big is the global water crisis? Dr. Greg Allgood: More than 748 million people do not have access to clean water and the problem in the developing world is so severe that nearly 1,600 children under the age of five die each day from diarrhea caused by contaminated water, poor sanitation and improper hygiene – that’s more than AIDS and malaria combined. Women and girls are responsible for water collection in 71 percent of households and in sub-Saharan Africa, they have to walk 3.7 miles every day to collect water. So when they have access to clean water in their community, it frees children from deadly disease; less money is spent on medicine which means more for savings and investing in things like education and the girls get to go to school instead of walking long distances to gather water. Question: What are the latest advancements in reaching people in need with clean water? Dr. Greg Allgood: We have several ways to reach the best clean water source whether it’s drilling deep wells or protecting springs. There’s nothing quite like providing water to a community for the first time. One of the most exciting innovations is our work using solar panels, a green energy source, to pump water to communities. World Vision is now the largest non-governmental provider of clean water in the developing world and we reach one new person with clean water every 30 seconds. Our approach is sustainable. A recent study showed that even after two decades water continued to flow because of community ownership of the water points. We also have an innovative and fun partnership with Sesame Street to reach school children in the developing world to teach good hygiene and sanitation practices that will dramatically improve their quality of life. Question: What are some creative ways people can be a part of solving the global water crisis and help provide clean water to someone in need around the world? Dr. Greg Allgood: If you like to exercise, you can join thousands of people who will be walking or running a World Vision 6K on World Water Day for children in Africa. 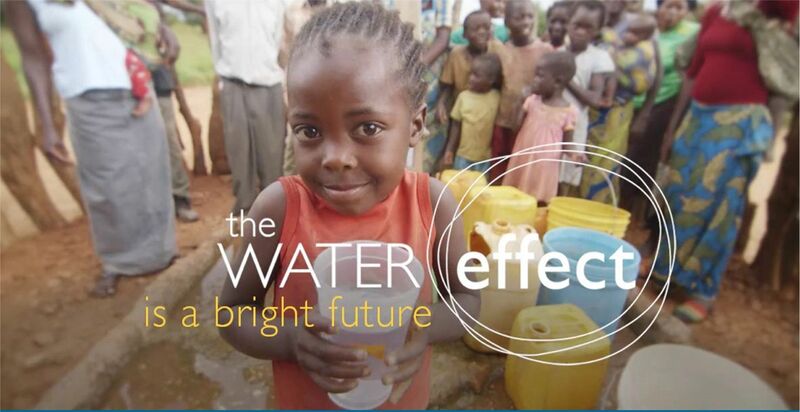 You can use social media to join celebrities like Pharrel Williams, Fergie and Pitbull by using the hashtags #WaterNow and #WaterEffect. For just $50, you can give one new person with clean water that lasts and a pledge of $25 a month helps six people get clean water for an entire year. You can be part of the solution at worldvision.org/water. Globally, 1 in 9 people lack access to clean water. More than one-third of the global population lacks access to improved sanitation. Dr. Greg Allgood is World Vision’s vice president for water. Allgood leads the establishment of alliances with corporations, foundations and individuals to enable World Vision to bring access to clean water to millions more people around the world. He holds a master’s in public health from the University of North Carolina at Chapel Hill and a doctorate toxicology from North Carolina State University. 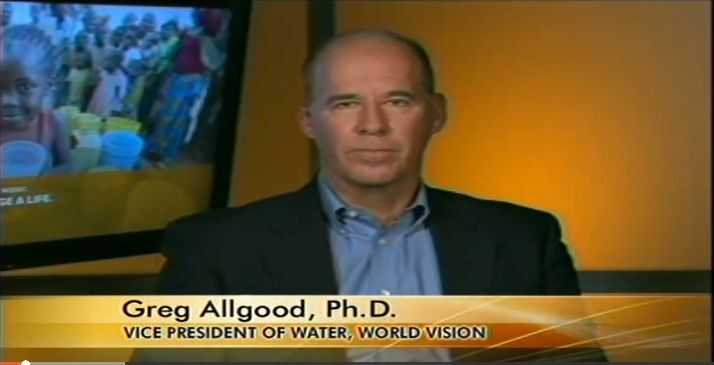 Prior to joining World Vision, Dr. Allgood created and led a global clean drinking water program that provided more than six billion liters of clean drinking water in the developing world and helped manage partnerships with the Clinton Global Initiative, the Bill & Melinda Gates Foundation, and other nonprofit organizations. Dr. Allgood is a frequent lecturer on public private partnerships, sustainability and safe drinking water in developing countries.